An ambulance service worker, suspended for allegedly leaking documents to the BBC, has resigned from his job. Steve Jetley and two colleagues from West Midlands Ambulance Service were suspended over allegations of breaching the Data Protection Act. 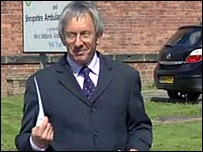 Control room logs were passed to the BBC amid concerns closing the Shropshire control centre would put patients at risk. Mr Jetley said he felt so strongly over the issue he felt he had to resign. The issue began when the ambulance service announced proposals to close two of its five control centres - one in Shrewsbury and one in Worcester. Control logs seen by BBC staff in July showed ambulances were sent from Shropshire to help in Birmingham and the Black Country, reducing the number of emergency vehicles available in the county. Some staff are worried if the closures go ahead there will be less cover for Shropshire. Mr Jetley, who left his computer business to work for the ambulance service four years ago, said Shropshire residents should fight for their ambulance service. "I see no other way that I can express how important these issues are," he said. "Shropshire ambulances need to be controlled from here and we need to stay in Shropshire." The suspended ambulance staff have been allowed back to work despite the ongoing investigation. A statement from the ambulance service said: "The investigation into a breach of the Data Protection Act has not been completed yet though all of the staff suspended have now been interviewed. "West Midlands Ambulance Service is duty bound to protect confidential public information. "The Trust awaits formal notification from the Information Commissioner about what it intends to do regarding this breach." The trust always sends the first available emergency response unit to each and every patient, it added.